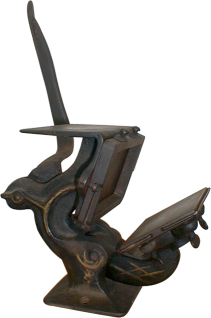 The Centennial, patented in 1875, was made by Joseph Watson before his business was bought out in 1896 by William Kelsey (maker of the Excelsior 3×5 and numerous other presses). The Centennial came in three sizes, from 2 1/4″ x 3 1/4″ to 3 1/2″ x 5″. It cost a dollar and a half to five dollars.